Is it rude to tell the truth? I am not a philosopher, shrink or an ‘all knowing guru’. I can’t compose concertos, issue manifestos and come up with elegant solutions to equations. Therefore, what I say, with my grade 8 education and street smarts, is based on a life time as a concentrated “truth seeker”. That’s a job you know, I got paid for it in ‘karma’, cause and effect. The question: is telling the truth RUDE? Is telling the truth insulting other peoples sensibilities? Are we obligated to lie to keep others comfortable? Some people have asked me why I use, as my main picture, such sad pictures of me when I look better with a smile on my face. I show you all my pictures, mostly with a smile on my face because that is what I do. I open my door to go out and on goes my shoes and my smile. I think that is what most people do. We expect people to do that. One day my friend looked at my picture on my blog and said, “Sam why would you use that picture you look so sad?” and I said, “Because I am”. Am I supposed to say I’me fine when I am not? And lets face it most people don’t really care what our troubles are on some level. Not because most people are mean but because it’s too overwhelming to see and know everything. I have tried being totally honest about how I feel and refuse to smile if I don’t really want to but then I get things like, you look so negative, scary, unpleasant, belligerent, crazy etc. In other words if I look happy and rich she must be ok. NO – I am just placating the masses and NO I am not rich just creative and a good thrift-shop shopper. I learnt this cover up routine when I was very small and molested; you pretend it’s not happening, it didn’t happen, I must protect the perpetrator so I must feign happiness. How can anyone really know and speak all the truth. If, according to Einstein most people only use about 10% of their brain it therefore wouldn’t be possible. We talk about there being your truth and someone else’s truth. I don’t believe that. Ultimately there is only one truth and the rest is perception. Some people will say perception is reality. 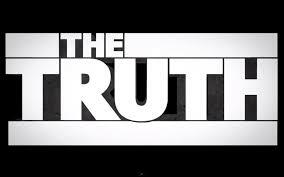 Yes, to them but I still say the truth lies with the source and the source only. I discovered that some people have a very nifty trick when you tell them the truth and they don’t want to hear and receive it – they tell you you are being rude. I would image that many times that stops people in their tracks, that’s why they do it. We don’t want to be rude after all, do we. One day I was telling the management of my building of some very bad behavior of our managers (seen, experienced, fact based and witnessed) and they told me I was being rude. Oh, is that so. I think violating our rights is rude. I think its rude to use money and power to eviscerate someone (me) based on someone else’s ‘convenient’ perceptions. Bottom line is, if someone calls you rude for telling the truth ignore them. I believe there is never a bad time for truth. It will be uncomfortable many times, for you as well as the other person, but the only way to go through life with your head held high it to tell the truth.